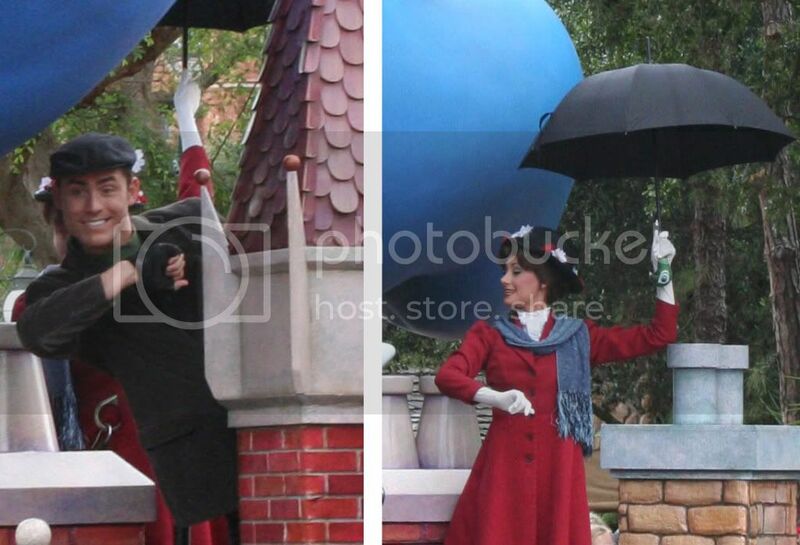 I found myself spinning through the Magic Kingdom turnstiles right at 3 o' clock a few weeks ago. What's at 3 o' clock? 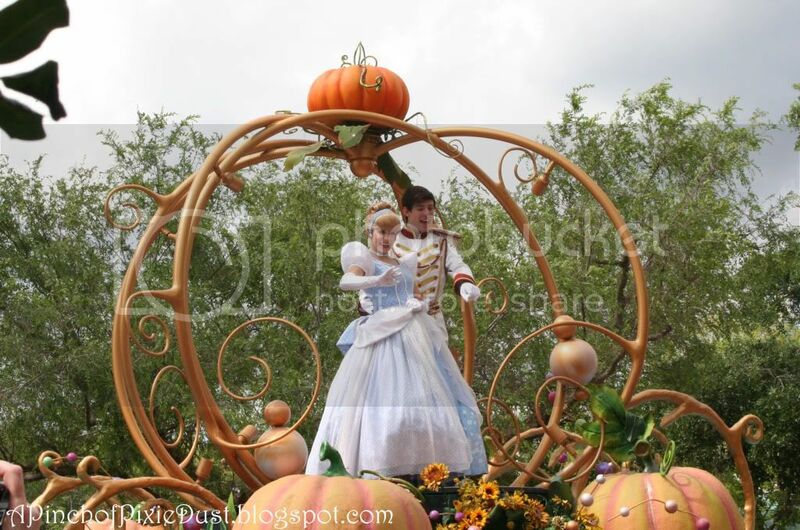 The Celebrate a Dream Come True parade of course! It was just circling Town Square as I came onto Main Street, and the crowds lining the sidewalk were wonderfully few. The music and the floats just caught me up in a festive mood, and I had to stop and watch it! 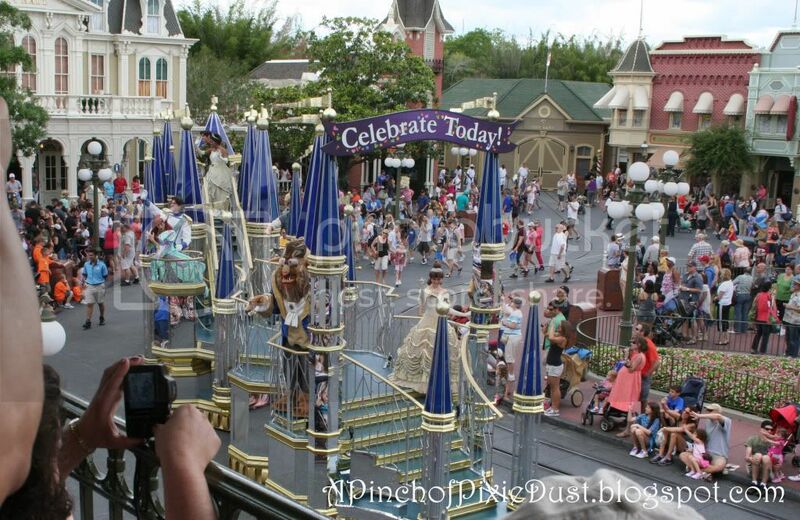 I watched the whole thing head down Main Street, then I cut through the Emporium and beat the parade to Frontierland to watch it all over again and get some more photos! I never would have thought of chasing the parade through the MK as something to add to my Disney to-do list, but it was actually really fun! There were so many interesting details and costumes and such that I had never particularly paid attention to before. But I think the most interesting thing, hands down, was the faces! 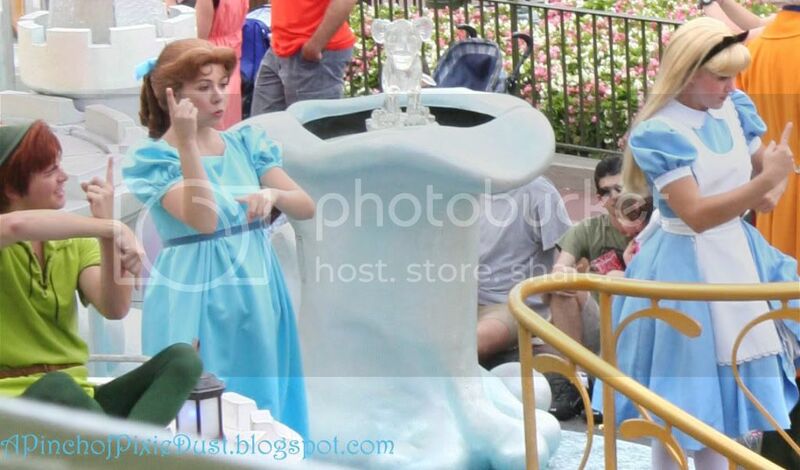 For instance -- what on earth are Peter and Wendy doing here? Or Alice? 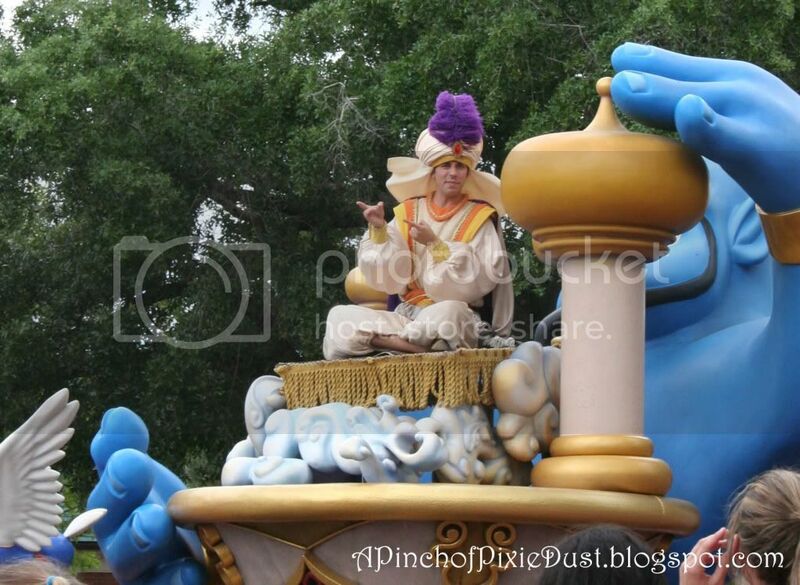 Aladdin looks like he's saying: "This way to the party, right?" Bert: " 'Ello there!" Mary: "Now do behave Bert. I'm the one doing the hard work holding up the umbrella!" Belle was so elegant and poised! The Fairy Godmother: "Y'all better be ready for Cinderella!" The Prince: "Hey! I know you!" 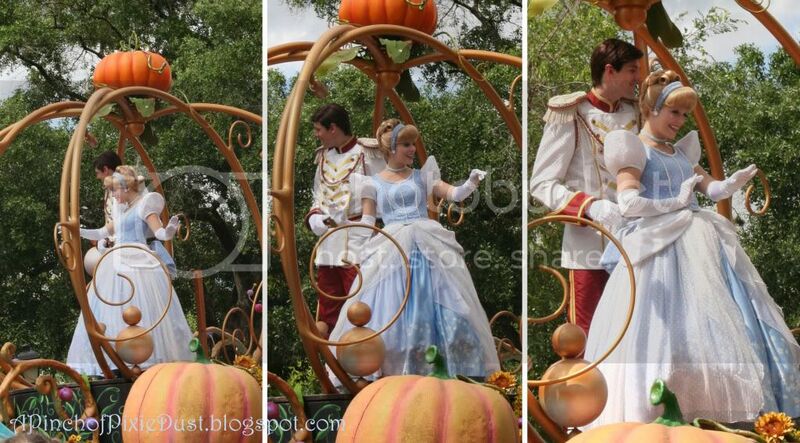 lol, ok, Cinderella was entirely elegant really. She was clearly thrilled to be out of the sea and meeting so many humans all at once, she was waving like a maniac, it was so cute! And can we just take a minute to admire her totally gorgeous dress? The long purple ribbons, that EPIC bustle, the golden lace at the end of the three-quarter length sleeves! I adore three-quarter length sleeves. Seriously. 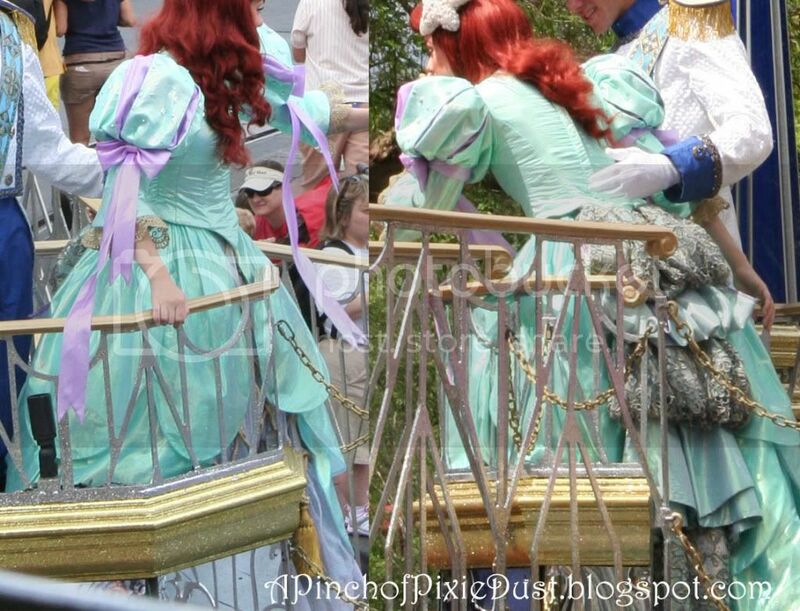 I want Ariel's parade dress! 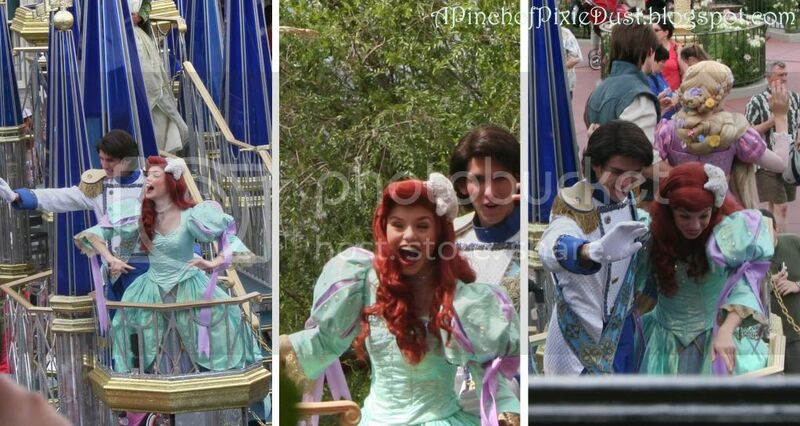 Another thing I envy Ariel is a Prince Charming! 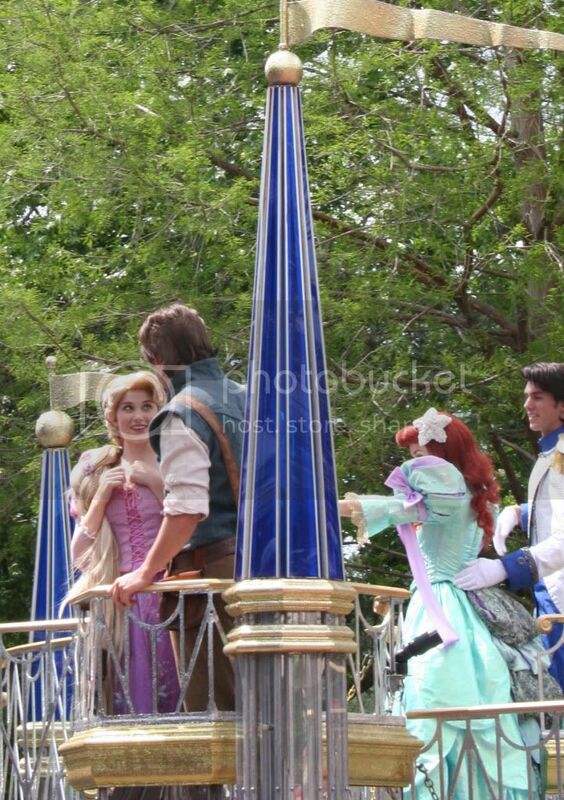 She and Prince Eric looked very much in love. I think the Beast might be gagging in the pic on the right. lol. 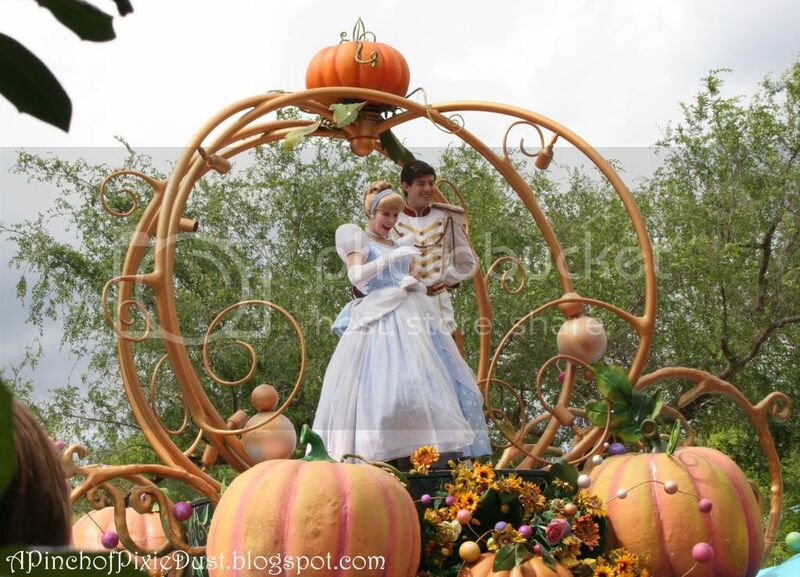 Rapunzel and Flynn were also adorable. 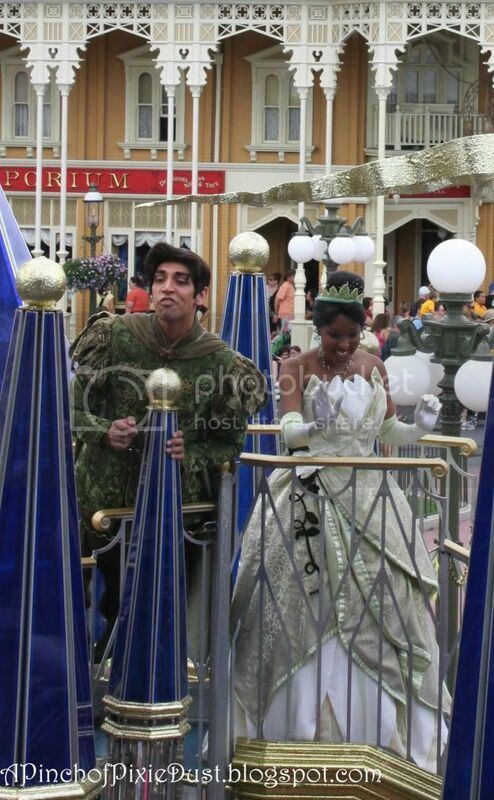 Tiana and Naveen were another fun couple to watch. 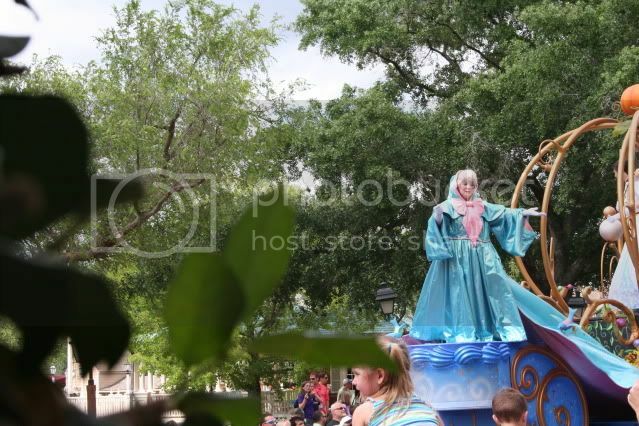 Naveen comes in second as my favorite character in the parade - his faces were hilarious! He was hamming it up for the crowds for sure! 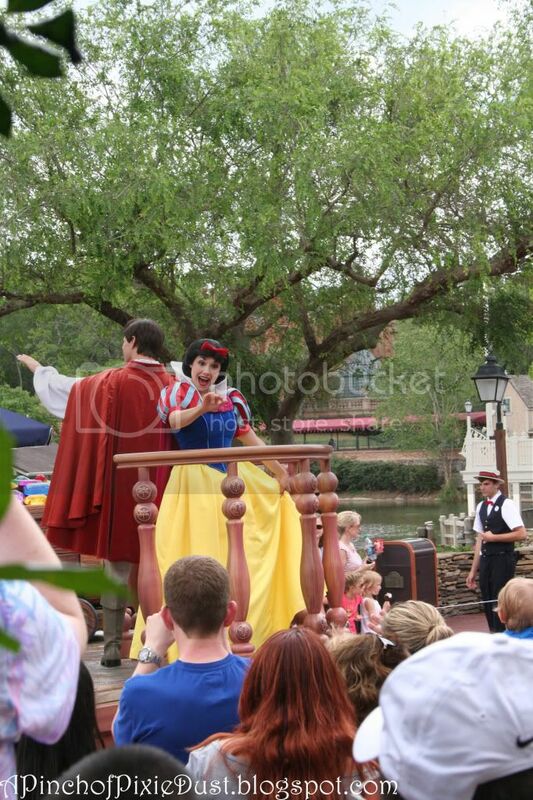 One last pic...look at Naveen blowing kisses to his adoring fans, lol. 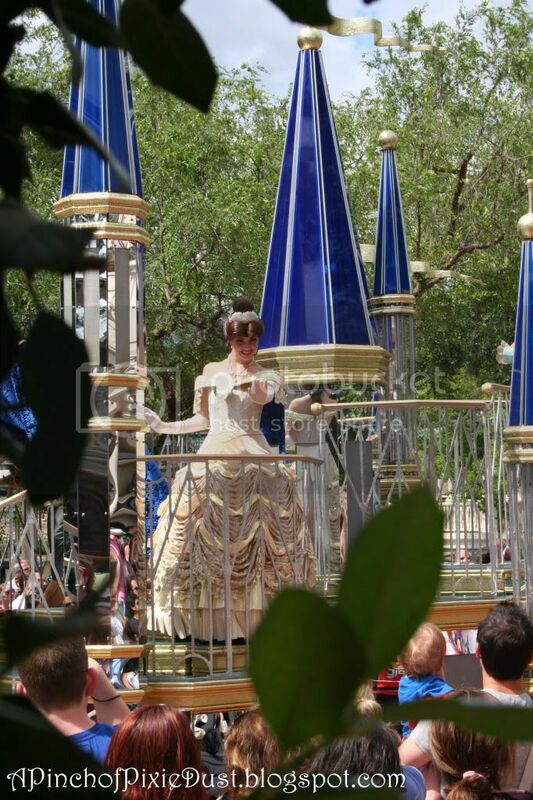 I actually took quite a few more pictures than this, so expect another parade post in the not-too-distant future. Hope everyone had a magical Thursday! You got some great pictures! I have not seen this parade in forever. I don't even remember Tiana or Rapunzel in it. 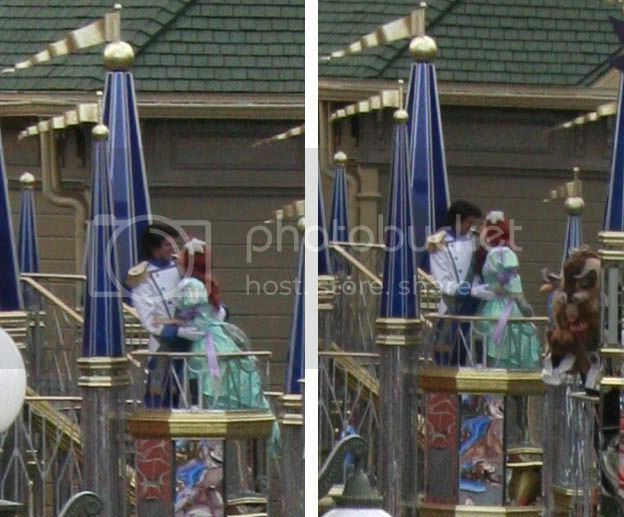 And you are so right about Ariel and Eric. 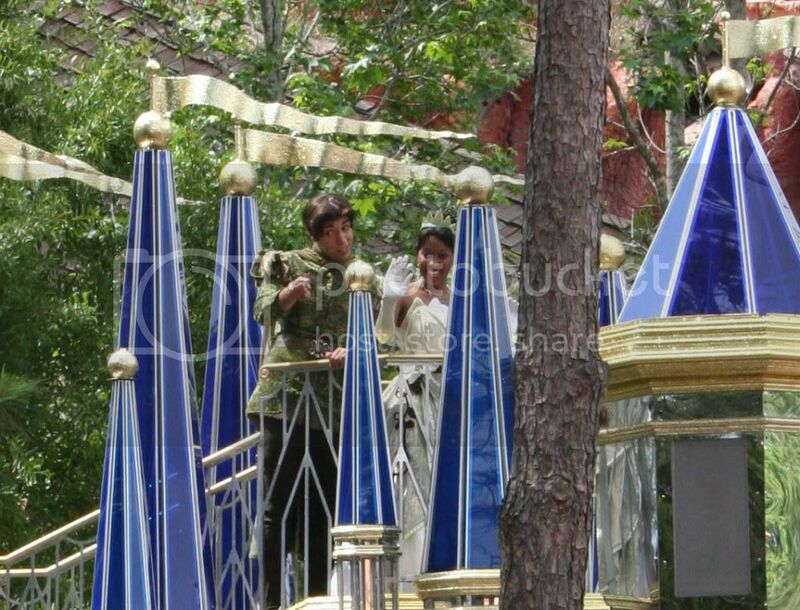 Are they dating in real life because I have never seen that kind of acting before! haha. Impressive! 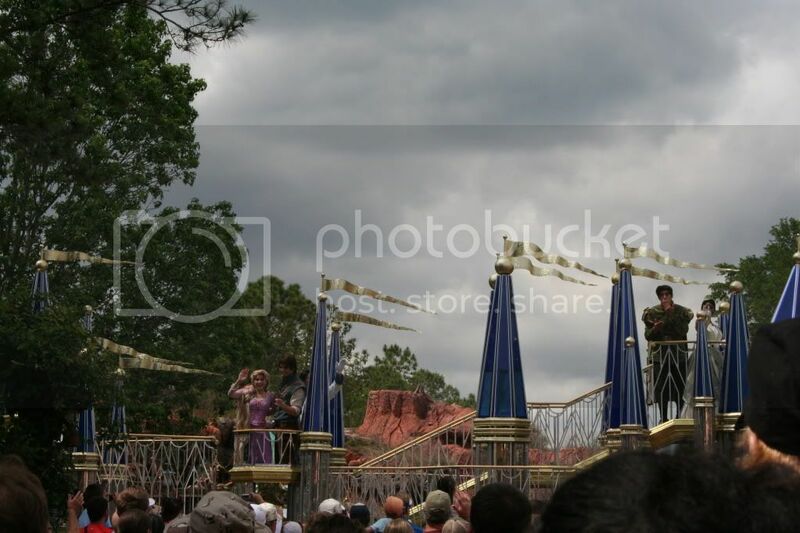 I remember how hard I tried to always take great parade pictures. I guess that's a good thing since I don't watch parades as much anyway (vacations are shorter when you don't have college vacation anymore haha). Totally enjoying getting to know your blog! It's awesome!